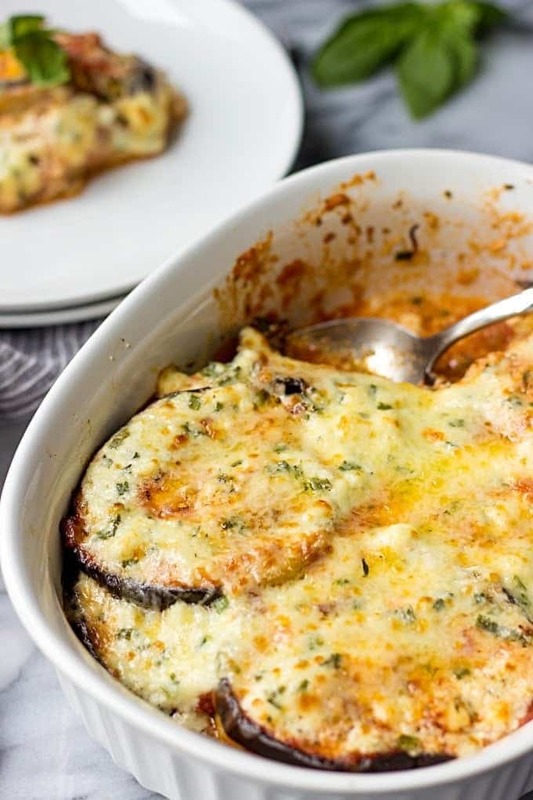 This creamy and scrumptious Eggplant Gratin is smothered with a secret white sauce and topped with a generous layer or Gruyere cheese. It is a side dish that is so easy to make and will be gone before you know it. If you ever ask me what my favorite vegetable is, eggplant would be one of my top choices. I have tried so many recipes with eggplant and I seriously can’t get enough of this meaty vegetable. In Ukraine, where I grew up, eggplants are crazy popular. We used to grow eggplants and as soon as they were ready to be picked, we loved incorporating them in appetizers, stews and make so popular in Ukraine and other post-Soviet countries Eggplant Caviar. Because of eggplant’s thicker consistency, it can easily be used in a variety of vegetarian dishes as a great substitute for meat. In fact, some time ago, I made eggplant meatballs and my meat-lover husband couldn’t even tell they were vegetarian. Recently, I made an awesome side dish – Eggplant Gratin. It has a French origin and you know that I’m obsessed with French cuisine. I first made Eggplant Au Gratin for my husband’s birthday and everyone absolutely loved it. As a matter of fact, what not love? Prebaked eggplant slices are layered with a rich tomato sauce, some basil leaves, drizzled with my secret creamy Feta cheese sauce and topped with Gruyere. Then everything is baked until bubbly perfection. Believe me, this Aubergine Gratin (how they call it in England) goes really fast. You can make it for holidays or at other times throughout the year. So much flavor and just like my new favorite French Chicken Gratin (have you had a chance to try it yet? ), this Eggplant Gratin is a total comfort food. Gratin is a special culinary technique which originated in France. According to the sources, gratin means that the recipe is usually prepared in the oven or finished under the broiler so that a crispy crust was formed. For the luscious crispy topping breadcrumbs and/or cheese are used. Gratins are usually prepared in a shallow baking dish. Nowadays, cooking Au Gratin became a very popular technique. And beside well-known Scalloped Potatoes or my new favorite Potato and Zucchini Gratin, cooks around the world started to use this method to prepare meat, seafood and all kinds of different vegetables. When I made this Eggplant Gratin recipe for the first time, I decided to fry the eggplants. And although the final result came out really delicious, but it also was a bit unhealthy. See, eggplant loves oil and it soaks it up like a sponge. So for frying individual slices of eggplant, I had to use quite a bit of oil. In addition, it added to the total preparation time. And if you’re just like me and love you recipes to be cooked faster, frying in batches is not a preferred way of cooking. When I cooked the dish the second time around, I prebaked the eggplants until it’s tender. And while it was baking, I quickly made my delicious secret white sauce. So what is my secret white sauce is made of? If you’ve never cooked with Creme Fraîche before, I highly recommend you to try it. It had a very rich and creamy taste. A little tart and somewhat resembling the sour cream. Creme Fraîche is very popular in French cuisine and is used both in hot and cold recipes. I personally like to use Creme Fraîche as a base for my Mustard Chicken sauce as well as a topping for desserts. If you can’t find Creme Fraîche in your local grocery store, not a problem. Just mix regular cream and sour cream in equal proportions. It depends. If you have an older and bigger eggplant, the skin can be a little tough so it’s okay to peel it before cooking. But if you’re using small and young eggplants, you can leave the skin on. If you’re looking for new side dish recipes with fresh eggplants, try my Eggplant Gratin and you’ll be surprised how good it tastes. Rich, creamy and super comforting. If you make my Eggplant Au Gratin, snap a picture and post it on Instagram with a hashtag #lavenderandmacarons. One of the BEST Eggplant recipes ever is right here! 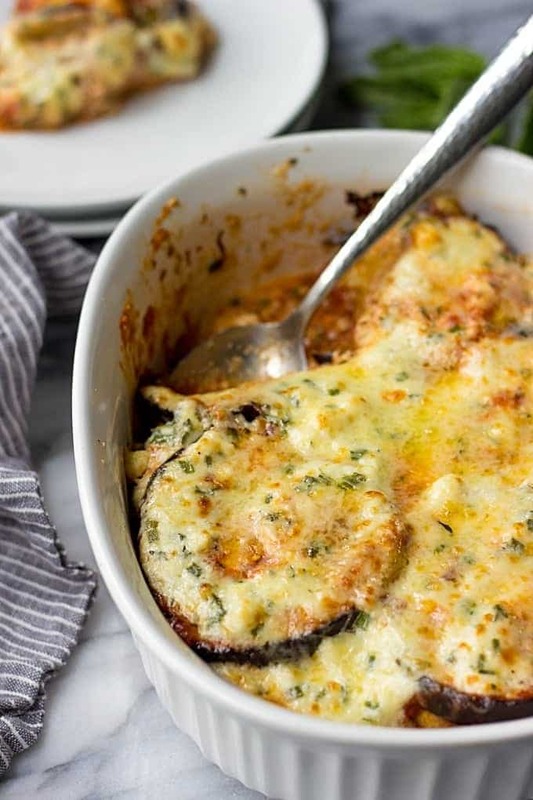 This EGGPLANT GRATIN or Aubergine Gratin makes a crowd-pleasing side dish! Tender eggplant is smothered with a fingerlickin tomato cream sauce, topped with Gruyere cheese and baked until bubbly perfection. It's a recipe you'll be making over and over again! Place sliced eggplant on a parchment lined baking pan (you might need to use 2 pans). Sprinkle both sides with salt and pepper and brush with olive oil. Bake for about 20 minutes until eggplant is tender. Meanwhile, in a small saucepan, combine Crème fraîche, half and half and Feta cheese. Bring to a boil and remove from the heat. Stir in thyme and chives and set aside. In 2.5-quart baking dish or gratin dish spread tomato sauce to cover the bottom. Place eggplant slices. They can slightly overlap each other. Spread tomato sauce once again and sprinkle with 1/4 cup of Gruyere cheese. Scatter 1-2 torn basil leaves over the sauce. Continue layering with remaining eggplant, sauce and basil. Finish with pouring over the cream and Feta sauce and sprinkling with the remaining Gruyere cheese. Bake for 15-20 minutes until bubbly and the top is browned. Serve warm. I simply love, love, love eggplant, aubergine or brinjal. I am always looking for new recipes to use this vegetable. Your recipe looks scrumptious and I will make it since I also love cheese. Thank you for this recipe. You’re welcome! 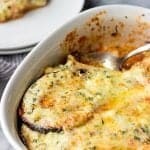 I hope you’ll like this easy Eggplant Gratin! I loved the flavors throughout this dish. It is simple yet so filling. I can’t wait to have it on the table again and my husband loved it too. I served it as a main dish with a Greek salad. Thanks for your comment Tracy! I’m happy you liked this recipe. And it definitely can be served as a main dish. Eggplant is so filling. Such a wonderful and simple way of cooking this looks like wonderful comfort food and I bet it tastes sublime! This is like one of the most satisfying dishes with aubergines – I love aubergines and can eat them in al,ost any way prepared. But with cheese on top always rocks! Oh my, this gratin looks sooooo delicious and appetizing! I love eggplant and use it quite a lot in my kitchen. Thanks for such a great creative recipe! Love the saltiness from the feta in this dish! Yes, it gives a nice savory bite. Thanks for your comment Tilly! YES eggplant is for sure my favorite vegetable of all times!! This looks simply amazing!!! wow this looks so yumm. 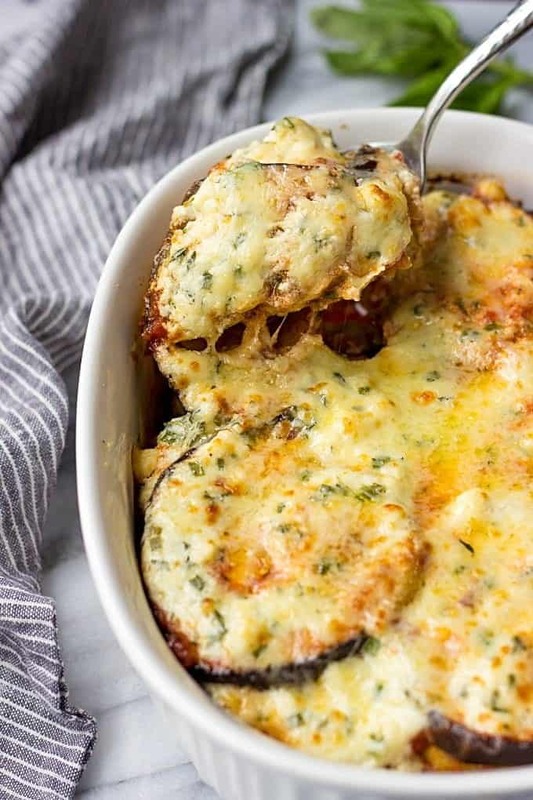 Great idea to use eggplants in an au gratin recipe. Pinning this. Wow! This sounds so amazing! With that luscious, creamy sauce on this gratin, even my husband (who thinks he doesn’t like eggplant, it’s all in his head!) would love it! I have to give this one a try! Thank you Beth! It’s really delicious, I’m sure your husband would like this as well. This looks fantastic. I bet the saltiness from the feta pairs really well with the eggplant! Eggplant is one of my favorite vegetables! What a creative dish! Beautiful flavors!!!! I cannot wait to give this a try! Love the feta in there! I’m probably one of the only people who’s never really liked eggplant — but I’ve started to come around recently. This gratin would make me a believer I’m sure. Do you know the nutrition breakdown? I’m watching carbs, calories and fat. Thanks! Sorry Tina, I’m not aware of this information. what is half and half please. This receipt look wonderful would like to try it. Thank you. How much tomato sauce, please? I would say, about 1/4 cup of tomato sauce per layer, not too much, just a thin even layer.